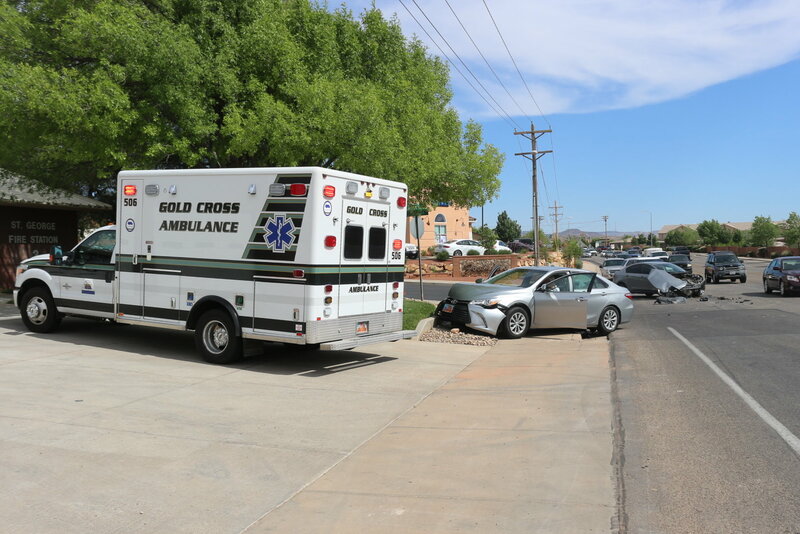 ST. GEORGE – An attempt to turn left onto River Road ended in a collision and one person being sent to the hospital Wednesday. 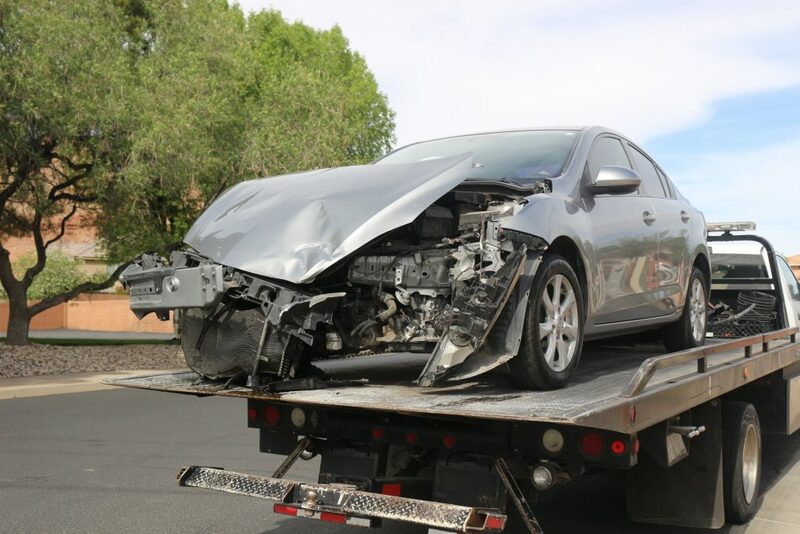 Just after 4 p.m., St. George Police officers responded to the report of a two-vehicle crash on River Road and found a Mazda 3 with heavy front-end damage. The car was poking out onto River Road from 2330 South. 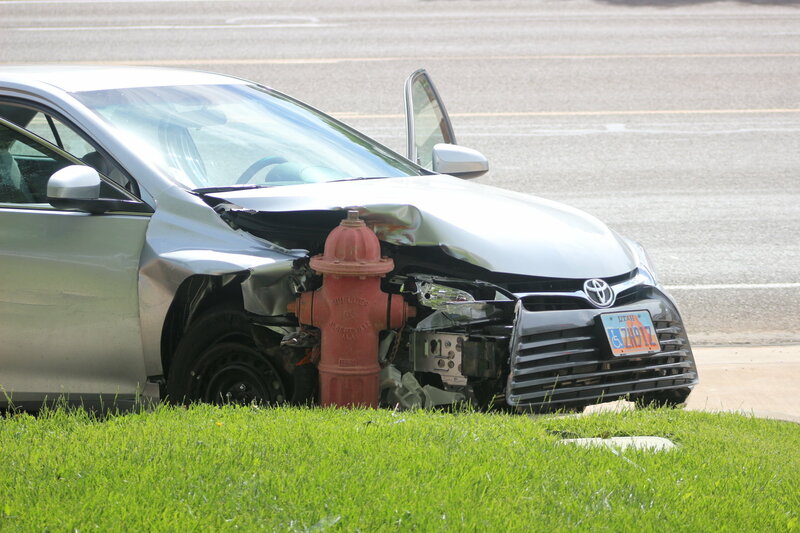 Just north of the Mazda 3 was a Toyota passenger car that had jumped the curb and crashed into a fire hydrant. 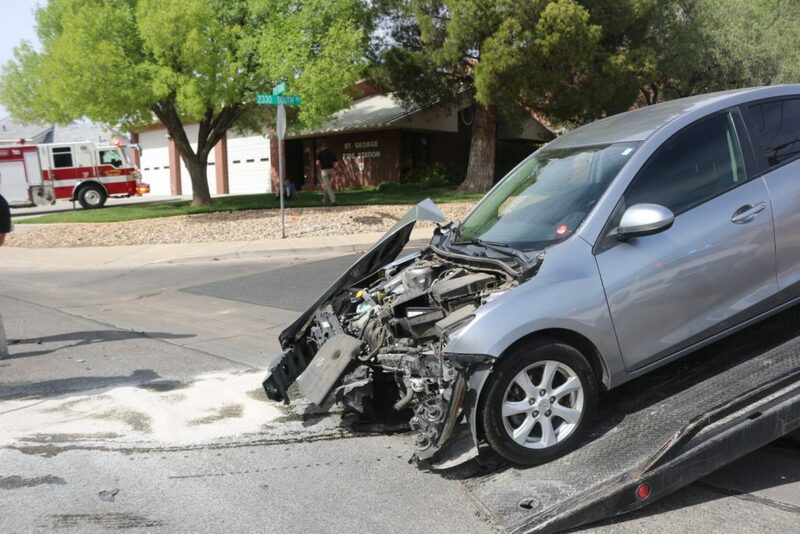 The Mazda was driven by a male juvenile who told police he had looked in both directions before attempting to make the left turn onto River Road, St. George Police officer Andy Mickelson said. However, when the teen made the turn, he didn’t see the oncoming Toyota in the outside lane and pulled out in front of the northbound car. 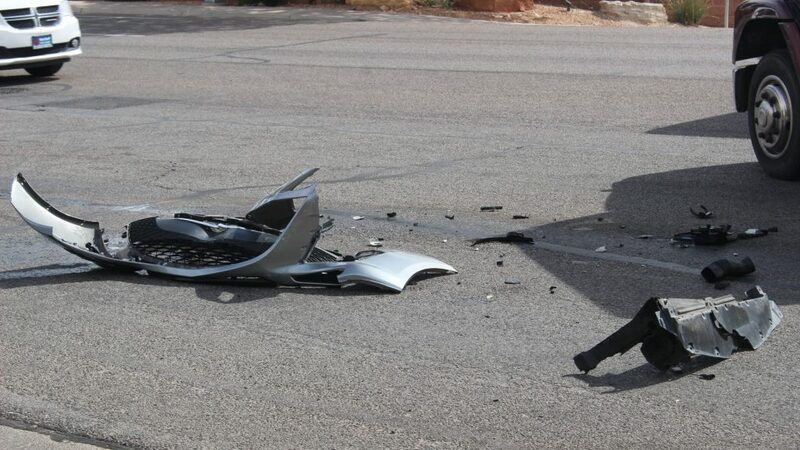 The resulting collision decimated both vehicles. The Mazda 3’s front end was nearly ripped off by the impact. 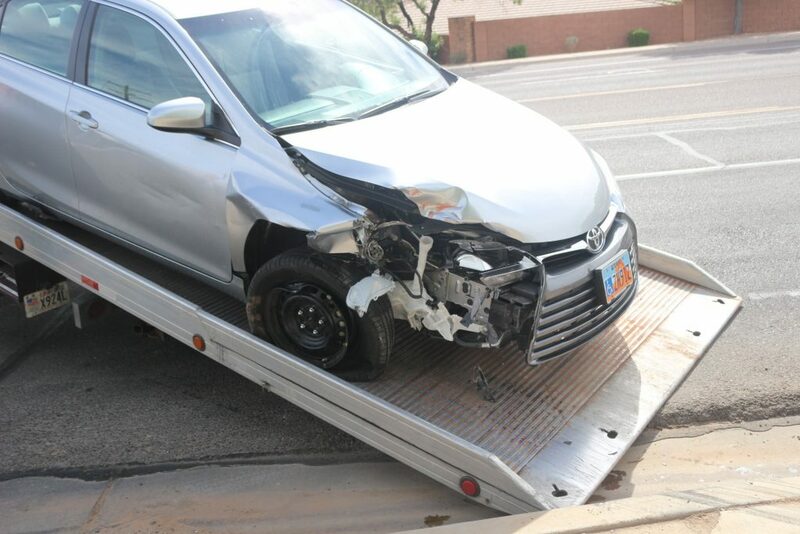 The teen appeared physically unharmed and was able to walk away from the crash. A woman passenger in the Toyota was helped out of the car by responding medics and taken to Dixie Regional Medical Center for examination. The male driver of the Toyota stayed seated in the car until a family member arrived and helped him out and into her own car with aid from the medics and firefighters who also responded to the scene. The teen was ticketed for failure to yield after a stop sign, Mickelson said. The River Road accident was one of four spread across the city that occurred at roughly the same time, Mickelson said. “Decimated” does not mean what the writer of this article and the vast majority of people think it means. The process of decimation was a punishment for a Roman legion. One in every ten men of the legion would be killed if Decimation was the judgment. The prefix “deci-” (one-tenth) is the giveaway but few people seem to pick up on that. Even its secondary and technically-incorrect meaning – “the killing of a large proportion of a group or species” – only applies to people, not objects. My theory about why so many people use “decimated” to mean “destroyed” is that it rolls off the tongue slightly better than “devastated,” which is probably the word they should have used in almost all cases. It’s happening in all media, especially the Weather Channel and the like. You’re a young, upcoming reporter and a Thesaurus is just a mouse-click away. Disclaimer: I don’t know if that’s the case here. Perhaps “Failure to yield” should be the official motto of St. George.